Everything You Want in Life at Your Fingertips! Scientifically proven and road tested, this is THE complete, powerful lineup of tools for success! In today’s society, we hear so much doom and gloom. The global economy is on a sharp decline, the housing market is terrible, and businesses are going bankrupt all over the place. So why are some people still wildly successful? That’s the question you must ask yourself – and answer – if you intend to be among them. The key is in how you look at the world and how you react to what you see. When you arm yourself with THE system proven to result in success, you become successful. I reveal that system in “The Best of Brian Tracy,” the collection of my absolute best programs and trainings. 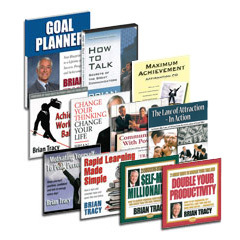 Brian Tracy's programs have changed my life, personally and professionally. He is the master at getting right to the heart of a subject. He synthesizes the very best ideas into one place and packages them into a system that gets results. Charles Tremendous Jones once said, “The difference between you today and the person you'll be in seven years are the people you meet and the books you read.” My life is forever better because of Brian Tracy's influence through his coaching, his tapes, and his books. Thanks Brian. Master your Mind: This is your most powerful resource, and tapping into that power is easier than you think—once you know how. Master your Time: It's the ultimate nonrenewable resource—once it's gone, it's gone forever. Master your Communication: Success comes much easier when you can easily get others on board with your ideas. Once you master these concepts – which is surprisingly simple to do – you become hard-wired for success. Once you “get it,” you attain outrageous levels of achievement without working any harder or longer than anyone else. In fact, your success will feel so natural, so easy, that you’ll accomplish more, faster, than ever before.